Who says pesto is only meant for pastas. 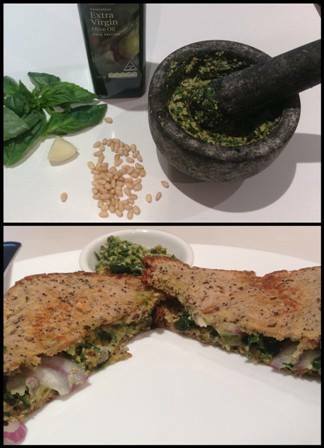 They yummy basil pesto can now double as a sandwich spread or a dip for your chips and pita bread. Pesto, originated in Italy and the word simply means ‘pound’; the ingredients are typically pounded in a mortar and pestle thus giving it its name. While the traditional pesto used parmigiano reggiano, also commonly known as parmesan cheese, this recipe is the skinny version of the spread and omits the cheese. Toast the pine nuts and keep aside. Crush salt and garlic in a mortar and pestle. Now add the toasted pine nuts and make sure it is ground coarsely. Toss in the basil leaves drizzle the olive oil, and muddle the ingredients to form a coarsely ground spread. Now use this as a spread for breads and wraps. You could also use this in salads for a nutty taste. You could also add a teaspoon of lemon juice for flavour. Typically this is also ground with sharp parmesan cheese. Include it if you like the taste.